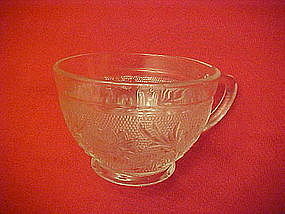 Lacy sandwich glass pattrn cup made by Indiana glass for Tiara, which has gone out of business now. This cup is in crystal and has the rounded sides. Measures 2 1/4" tall and has a small foot at the base. Not sure if these are just plain cups or called punch cups. 3 3/8" diameter across the top. I only have one of these available.Perfect condition.